The Delta Regional Authority is committed to improving health outcomes throughout the Delta region. Our belief is that health is an economic engine and will drive future economic growth. However, the growing incidence of chronic disease in Delta communities poses a threat to the lives, livelihoods, productivity, and economic vitality of the Delta region. In recent years, there have been studies commissioned by Harvard University’s School of Public Health and other institutions that show a direct correlation between economic vitality and health, measured through changes in life expectancy, emphasizing the link between poor health outcomes and poverty. Compared with national rates, deaths in the Delta region from circulatory diseases are 16 percent higher, deaths from cancer are 12 percent higher, and deaths from accidents are 39 percent higher. More than 32% of adults in the Delta report that they are obese and almost 12% report that they have diabetes. 230 counties and parishes within the Delta region are considered Health Professional Shortage Areas (HPSAs) by the US Department of Health and Human Services. 95 counties and parishes in the Delta region do not have a Federally Qualified Health Center. 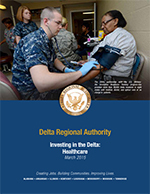 In April 2010, the DRA released a policy framework for addressing the healthcare needs of its populations in the “Growing a Healthy Workforce in the Delta” Action Plan. With that framework the DRA has dramatically expanded funding and programming to grow healthcare infrastructure to increase access to healthcare and expand the quality of equipment and services local healthcare centers can provide to Delta residents. The Delta Regional Authority (DRA), in collaboration with the Health Resources & Services Administration (HRSA) of the U.S. Department of Health and Human Services (HHS), is launching the Delta Region Community Health Systems Development – Technical Assistance Pilot Program. The purpose of this program is to enhance health care delivery in the Delta Region through intensive technical assistance to providers in select rural communities, including critical access hospitals, small rural hospitals, rural health clinics and other healthcare organizations.